Chobe Chilwero is a high quality lodge set high above the banks of the Chobe River. Its facilities include a superbly-equipped spa and a split level swimming pool for pampering and relaxing between safaris. Your suite has a home-from-home feel, with sunlight flooding in through the main windows, brightly coloured cushions, a chaise longue at the foot of the bed and lots of storage space. A large mosquito net can be drawn right around the bed and bedside tables. Air-conditioning and fans make the room refreshingly cool. To the front there’s a covered terrace with a table and chairs, where you can sip a freshly made cup of tea or coffee. The terrace overlooks your own private garden. Leading off the bedroom the bathroom has a large bathtub, two hand basins and a shower. There’s an additional shower outdoors. The pool suite also has a private plunge pool. There are three family suites, each with two bedrooms. The main area of the lodge has the same sense of light and space as the cottages. Settle back into an armchair as you leaf through a book, or walk through the doors and find a quiet spot on the terrace to enjoy a chilled drink. Meals are prepared and served with great care, with lunches and dinners accompanied by fine wines from the lodge’s extensive cellar. The spa facilities include a Vichy showers, hydrotherapy, an indoor spa bath and plunge pool. The range of treatments is comprehensive and there are individual treatment rooms including one set in a treetop. In the hottest part of the day you can cool off with a swim in the split-level pool. Activities include morning and afternoon game drives in Chobe National Park, famous for its large herds of elephants, daytime boat cruises on the river, and romantic sundowner cruises on the double deck boat which has a bar on the lower deck. Catch and release fishing trips and excursions to Victoria Falls can be booked and paid for locally at the lodge. You can also visit the Dipetsana Women’s Bike Shop, set up with funds from Sanctuary Retreats, which provides both an important means of transport to the local community and a valuable income for the women who work there. It is also possible to visit the Caracal animal rescue centre near the lodge. If you’re looking for a Chobe safari in style, comfort and somewhere you can combine with being spoilt then you’ll love this lodge. It caters for every little luxury and the spa is to die for! Children of all ages are welcome. Children’s activities can be arranged and each child is given a back pack with a colouring book, pencils, torch, water bottle and children’s binoculars. There are three family suites with two bedrooms and a shared bathroom. Children under 5 can go on game drives only at the discretion of the lodge manager and if a private vehicle is booked. 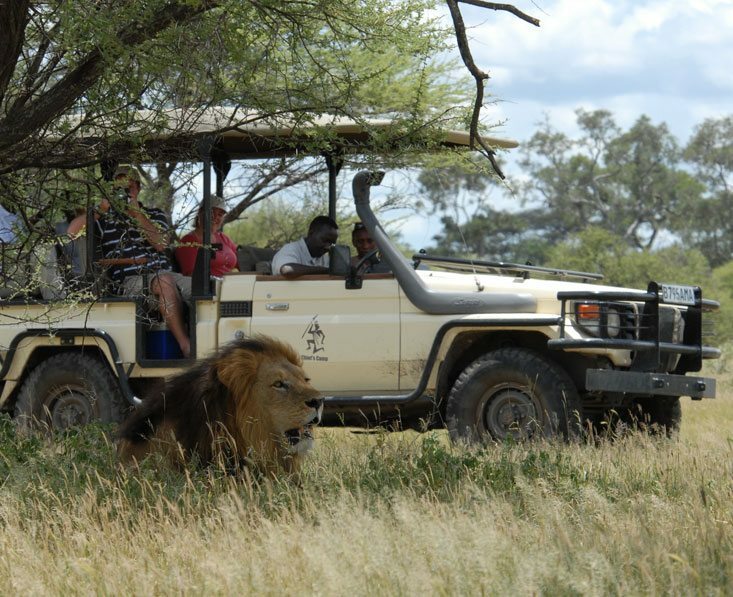 Children between 5 and 11 can go on game drives only at the discretion of the lodge manager. There is a children’s menu. Babysitting can be arranged. The camp is fenced. There are 15 suites including three family suites and one pool suite. The accommodation is very spacious and tastefully furnished. Each suite has a terrace and private garden. The pool suite has a plunge pool. Family Offer – Children under 15 stay Free! Stay a minimum of 2 nights at any of our lodges & camps in Botswana and for every full paying adult, one child under 15 sharing with his/her parents will stay free of charge. Normal child age restrictions apply per camp. Added Value: Stay a minimum of six nights in green season and also qualify for our Green season offer if one of those lodges are booked. Stay a minimum of 5 nights at any of our lodges & camps in Botswana, and your first night is on us. Added Value: Combine with our family offer where for every full paying adult, one child under 15 sharing with his/her parents will stay free of charge.